In the thirties Hitler’s regime allowed more than 6000  not very affluent  Jews to establish themselves in the Netherlands. Only for one reason: to spread anti-Semitism. Who was waiting for such ‘poor beggars’? With the help of the Dutch authorities and the American Jewish philanthropic institutions, the Committee for Jewish Refugees took care of their maintenance as much as possible. During the War, on the initiative of the churches, the Committee for Support was set up to take care of the refugees. In spite of all the opposition by the Germans, the committee kept on functioning till the end of 1942 and raised and distributed six million guilders. At the beginning of the Second World War the family Reinheimer was the only Jewish German family living in Meppel. 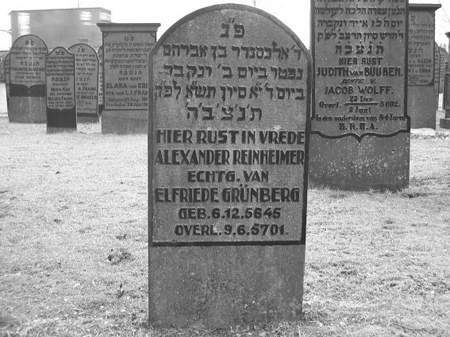 Alexander Reinheimer, his wife Elfride Grunberg and their son Paul had come to live in Meppel, when the Saargebied (Saar region), fell into German hands in 1933. Alexander Rheinheimer, who originated from the Saar territory, died in Meppel. Alexander was given permission to take all his money and goods with him. From the money he bought a house on Stationweg and a shop on Woldstraat. The shop was furnished with the machines that he had brought with him from Germany and thus he started a pleating service. The Reinheimer family was the first Jewish family in Meppel to be confronted with the anti-Jewish sentiments of the German occupier. On the 19th of July the Secretary General of the Ministry of the Interior sent a letter to the Meppel authorities concerning the registration of Jewish refugees, which concerned the Reinheimer family. Their names had to be written on special cards. With that the special regulation of 16 October came to an end, according to which the information regarding these refugees could be recorded in the Register. The last sentence of the letter mentioned above characterizes the attitude of the occupier towards the Jews. The new cards, with in red ink ‘Card J V renewed’ have to be sent immediately to the Inspectorate of the Registry Office. By this measure the Jews who had entered our country between 1933 and 1938 (the majority had fled from the Nazi-regime) were registered and in this way they were clearly visible. The Meppel population would notice very little of these measures. But it remains to be seen whether the next measures against the German Jews would remain unnoticed. *Henriette Grunberg left Rotterdam on the 17th of October 1940 to go to Arnhem. Two months later she came to Meppel. Without any doubt the local residents must have noticed these ‘strangers’, and they may have wondered: ‘What are all these people doing in Meppel all of a sudden?’ They did not receive a satisfying answer of course. It was just one of the German measures to annoy the Jews. What other reasons could there have been for forcing them out of the coastal region to the hinterland? To find accommodation for these twelve Jews cannot have been easy, all the more, because nearly all of them arrived in Meppel penniless. The Jewish Refugees Committee played an important role here by providing accommodation, food and pocket money. Most of them were put up in houses on Heerengracht, Steenwijkerstraatweg, Keizersgracht and Woldstraat. They regularly moved from one place to another. In the two years that Fritz Blasbalg lived in Meppel he moved from Zuideinde, to Steenwijkerstraatweg, to Keizergracht and back again to Steenwijkerstraatweg. Fritz Blasbalg came from Germany penniless. In Meppel he was supported by the Jewish community as much as possible, but more than the bare necessities they could not pay for him. So it happened that Fritz used to walk around Meppel in worn out shoes with holes in the soles. Joël van de Rhoer (‘de Rieke’) (‘the rich man’) saw that and offered to have his shoes resoled at his cost. Fritz was very pleased and the shoes went to the shoemaker to be resoled. He could finally put on ‘decent’ shoes again, and van Rhoer thought ‘he must be content’. On the contrary, for when he asked Blasbalg ‘What do you think of your resoled shoes’, he answered: ‘They are not according to my wishes, because I always resoled my shoes with ‘core leather’ (an exceptional quality of leather, TR) and that was not done this time.’ Since then the Van de Rhoer family has used the word ‘core leather’ as synonymous with ‘gotspe’, an impertinent impudence. 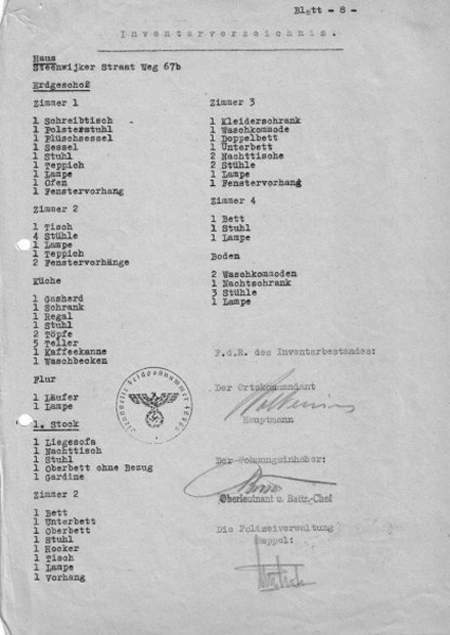 In September 1942, Meppel police drew up an inventory of all household goods of the Frank family, who lived on Steenwijkerstraatweg, which were confiscated by the Wehrmacht (the German Army). In November 1940, Treinle Wechsler came from Rotterdam to Meppel. Treinle was born on 19 November 1872 in Aschbach, Germany (presently the municipality of Bamberg in Bavaria). She was the widow of Meyer Rosenberg who was born 4 September 1869 in Leer (Ostfriesland - Germany). After their wedding the couple settled in Leer, where they worked respectively as ‘Kauffrau’ (saleswoman) and ‘Kauffmann’ (salesman). Meyer died around 1912. Treinle first moved to Bad Arolsen and later came to the Netherlands as a refugee trying to escape from the Nazi regime, and went to live in Rotterdam. By one of the first anti Jewish measures she was forced to leave Rotterdam at the end of 1940. In Meppel she first lived at 35 Woldstraat and in 1941 she moved to 36 Molenstraat. This was the boarding house of Mrs Kan, where other Jewish ladies were staying. On the night of 2nd to 3rd October 1942, Treinle was taken from the house and taken to Westerbork. Neighbours heard her shouting: ‘My prayer book, my prayer book ...’ For quite a while she stayed in Westerbork before she was deported to Theresienstadt, where she died on the 3rd of November 1944. 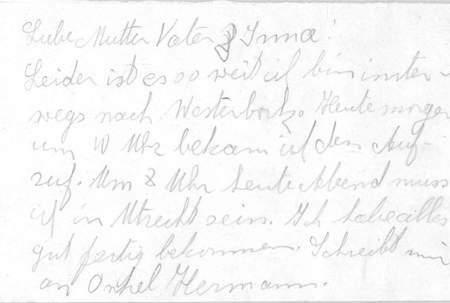 We have some more information about two German Jewish families: The Hellmann family and the Frank family. For Siegfried Hellmann his coming to Meppel was the second setback in a short time. During the 1940 bombardment of Rotterdam Siegfried Hellmann lost his house and all his possessions. He lived on Aert van Nesstraat where he rented a room for fl 2,75 a week. On 16 October 1940 he came to Meppel. Also his sister Emma and her daughter Elisabeth left Rotterdam and came to Meppel. 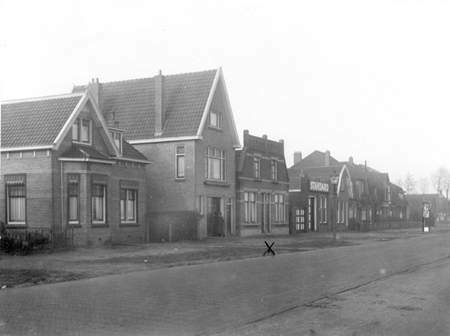 Completely broke, Siegfried appealed to the Jewish Refugees Committee, who first housed him on Touwstraat and later a room was arranged and paid for on Steenwijkerstraatweg for fl7 per week. He had full pension and an extra fl 0,75 as pocket money per week. Before leaving Rotterdam he had received clothes from the Municipal Services for Social Assistance in Rotterdam, but as winter drew closer it was not enough. In an emotional letter he wrote to the Social Services and Assistance in Meppel on the 8th of November 1940. Siegfried Hellmann was penniless when he came to Meppel. This letter was a request to the local authorities for support. I am in a very deplorable situation and as I have no money and no means or opportunity to receive money from England, will you please allow me to have the following: 1 suit, 1 shirt, 1pair of pyjamas. Luckily the Social Services and Assistance lived up to their name. 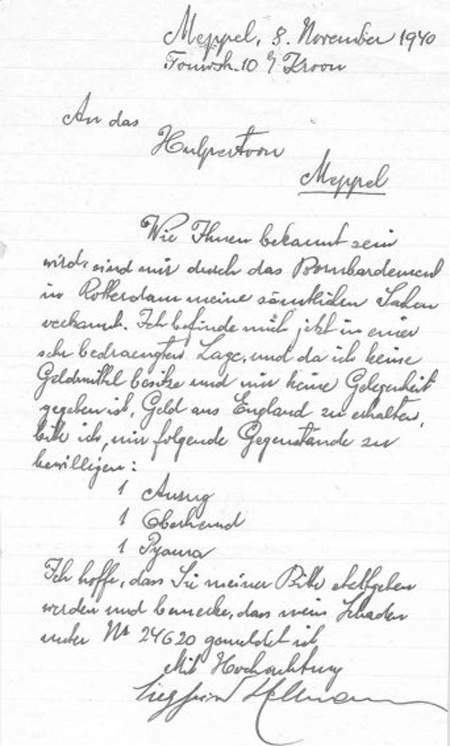 In January 1941 Siegfried received some clothes: a suit, a pair of pyjamas, socks, woollen vests, underpants, pullover, shirts and shoes. In that same year Siegfried Hellmann moved from Steenwijkerstraatweg to 53 Heerengracht. In the winter of 1941 he again was in need of clothes. This time he received a winter coat, a scarf, a blanket for a single bed and a couple of shirts. From the answers to the requests, now written in Dutch, it appears that Benjamin Kroon -probably on behalf of the Jewish community in Meppel- looked after the interests of Siegfried and translated his letters into Dutch. It then became evident how dramatic his situation was. Hellmann had left Germany in the nineteen thirties to escape to Australia but was not allowed to take any money with him, so he converted his capital into clothes, jewellery and suitcases. In total he had fl 2451,- in goods. He had lost all these things during the bombardment of Rotterdam. In spite of his claim for damage he never received any compensation. Penniless and lonely he came to Meppel, but things were going to get worse. On 5 May 1942, 63-year-old Siegfried was taken by the SS from his house on Heerengracht. Policeman Veldhuis took him to Assen. That same day he arrived in Westerbork. Why this sudden departure? We do not know. He was the first Jew who had to leave Meppel by order of the Germans. On his ID card was written ‘Convicted prisoner since May 1942’. On 30 September 1942 he was killed in Auschwitz. Probably because of her brother Siegfried’s abrupt departure, Emma left Meppel and went to Amsterdam. On 17 June 1942, Meppel local council received a letter from the chief of police in Amsterdam, from which it appeared that Mrs Hellmann had reported to the police without the so called ‘check out form’, which was compulsory according to the ‘Circular letter concerning foreigners nr. 4, paragraph 39’. In the letter he asked for the ‘check out form’. Promptly the form was sent with an excuse from chief inspector Breedveld: On 26 May 1942, the lady had asked to be transferred from the Meppel Register to the Amsterdam Register, but had not informed the police. Breedveld did not understand who had supplied her with a ‘Reisepass’ (travel pass). Emma did not stay long in Amsterdam; she died on 19 February 1943 in Auschwitz. Emma had come from Rotterdam to Meppel together with her daughter, who was born in Bamberg in Germany in 1914 as Elisabeth Sara Böttinger. They were lodged in 2nd Hoofdstraat, Steenwijkerstraatweg and Keizersgracht. The mother stayed on Keizergracht, but her daughter moved again, this time to Woldstraat. On 22 October 1941 she married Samuel van de Rhoer also living in Woldstraat. The couple moved in with his parents. Soon after her marriage to Samuel, Elisabeth expected a baby. Everything seemed to go well, until Samuel had to leave and go to work camp Linde on 17 August. Now she had to manage it all alone… the birth of her baby was at hand. Little Levi Leopold was born on 13 September. He was not healthy and died on 2 October. In the meantime father Samuel had been taken by the Germans from Linde to camp Westerbork and it was there that he would see his wife once more. Elisabeth not only had to bear the loss of her child alone, but she also had to organise the funeral, which was originally planned for Sunday the 4th of October at 13.00 hrs. Probably the baby was already buried on Saturday morning in the so called ‘children’s row’ at the Jewish cemetery. Elisabeth was the only family member present, as she received permission to stay in Meppel for the funeral while the rest of the Meppel Jews were taken out of their houses on Friday night. After the funeral, policeman Roelof Veldhuis took her to the station without any pardon, where she took the bus to Westerbork at 15.00 hrs. At the station they met a few acquaintances who said: ‘Veldhuis please look the other way, and we will make sure that Elisabeth finds a hiding place.’ Veldhuis ignored the proposal and she was put on the bus which took her to Westerbork with all the consequences. She died on 3 September 1943, her husband on 31 March 1944. Albert and Henriëtte Frank lived on Steenwijkerstraatweg with their daughter Irma. The couple had also two sons: Sally Heinz and Walter. 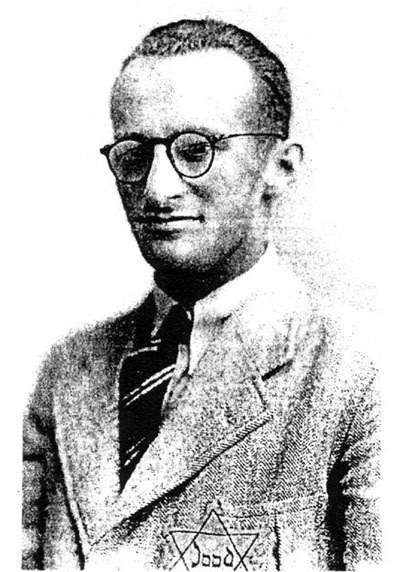 Heinz, as he was known, lived and worked in Wageningen where he studied to establish himself in Palestine (he was a so called Palestine pioneer). Walter went underground; he would be the only surviving member of the Frank family. Mrs Frank corresponded with her son to keep each other informed about events in their lives. She wrote and posted a letter on the 18th of August. Naturally, she wrote about her husband who was put to work in Orvelte. The letter reached the Wichards family where Heinz stayed on 20 August; they wrote back at once. This morning we received your letter addressed to Heinz, but to our regret Heinz is no longer here. Yesterday morning at nine thirty he received an order to be in Utrecht at 8 o’clock in the evening. From there, he would go to Westerbork together with others. He controlled himself when saying goodbye, better than any one of us. He took enough clothes and provisions with him. We will send a parcel to H. Seligmann and one to E. Otten. We arranged with Heinz that if you need anything, you should write to us and we will send it to you. We should also keep each other informed by letters, if any of us hears from Heinz. Heinz was going to write to you, while he was on the tram. I am sure he must have done that. Indeed Heinz had sent a card to his parents. In German, the language they knew best. Unfortunately, it is so far. I am on my way to Westerbork. This morning at 10 o’ clock I received an order to be in Utrecht at 8 o’clock this evening. Well, I got everything finished. Now I am going to write to Uncle Hermann. Frank’s letter to his parents on his way from Utrecht to Westerbork. From his card it appears that he was not aware his father was no longer at home! Heinz became a ‘lost’ son, as he never arrived at Westerbork. His mother got worried and in tears she reported him missing to the Meppel police, who knew nothing about it, but offered to help. In reply to your letter and sending you back the supplements attached, I am pleased to inform you that Sally Heinz Frank, born in Dermoselfalz on 17 March 1920, at first reported late for the transportation of Jews to Westerbork. After staying here in Utrecht for a few days, he made his own way to Westerbork to report there on 27 August. I advise you to contact the commander of the camp once again to inquire if Frank has arrived now. The next step was of course to phone the administration of the camp again. They informed Meppel police that Heinz had arrived in Westerbork on 29 August. With typical German thoroughness, they even gave the registration number of the young man: K5509 225. Police officer Rondhuis had the ungrateful task to inform Mrs Frank. What had happened to Sally Frank in the meantime? After receiving the order to report in Utrecht, he probably left the house of the Wichards family in Rhenen and went into hiding in Opheusen in the Betuwe. Since he knew that his parents and sister could not find a hiding place, he took this step against his will, for he did not know for sure if any retaliatory measures would be taken against them. The Wichards family had regular contact with him and sent him parcels by way of an address in Rhenen. Sally stayed in Camp Westerbork until the end of 1943 and was then transported to Auschwitz. He died on Christmas Day of that year. The letter the Wichards family wrote on 27 April 1943 to the Bisschop family. The Frank family not only received provisions from the Wichards family, but was also taken care of by bicycle dealer Bisschop from Nijeveen. He would regularly cycle to Westerbork to deliver a parcel. One of the daughters of Mr Bisschop remembered - she was about seven - her father would regularly take provisions to Mr Frank sr. He would put them or bury them in a place they had agreed and later they were picked up by the Frank family. They also wrote letters to the Frank family. When the letters no longer arrived, the Wichards wrote a letter to the Bisschops on the 27th of April 1943 with the address of Heinz Frank in camp Westerbork, where he stayed at that moment. It said that they no longer dared to have any contact with Heinz Frank. On October 18, 1940 the German Jew Leo Paul Westreich came from Terneuzen to Meppel. He was taken to the Stationsweg number 10 to the Klaassen family. Dr. Jacobus Andries 'Ko' Klaassen was pharmacist at Brocades & Stheeman. Westreich was an engineer, but he could no longer work in Meppel. His profession was erased on his personal card. Leo Paul Westreich was born as a son of David Westreich and Ernesta Glücklich on March 27, 1883 in the small village Petrovice u Karviné, nowadays in the Czech Republic, 18 km from the Polish-Czech city of Teschen (Cieszyn / Český Těšín). Leo had no wife or children; he was single. Although he had four Jewish grandparents, from 17 August 1915 Leo was Evangelical Lutheran. On July 17, 1942 he was transported to a Work camp in Orvelte, together with twenty other Jews from Meppel. However, Leo was not transported to Westerbork from Orvelte but returned to Meppel on October 3, 1942. Why he could stay in Meppel is unclear: Was it because of his religion? Soon after that, Meppel would be a banned area for him. The German occupier ordered on April 10, that the north of the Netherlands had to be Jew free. On the 8th of April Leo received a message from the police of Meppel. He had to go to Vught the 9th of April.This was the last sign of life. Certain is, Leo Paul Westreich arrived in Vught. From camp Vught, Leo was brought to Westerbork. On September 4 1944, Leo and 2073 other Jews (his personal number was 1918) are deported with Transport XXIV / 7 to Theresienstadt. The one before last transport from Westerbork. From this transport, 1231 survived the Holocaust. Whether he belonged to those who survived was unknown, until recently. Anna Hájková of the Terezin Study Center reported that Leo Westreich was a member of the so-called 'Protestant group'. A small part of this group was sent from Theresienstadt to Auschwitz-Birkenau with one of the 'Autumn transport' in 1944 (as a result about 15 members of that group have not saved it). Westreich was one of them and joined 1500 others on a transport to Auschwitz the 16th of October 1944. That means he probably arrived on October 18th and because of his old age he was immediately gassed. Together with him, 1371 others of this 'Autumn transport' were killed. Most refugees would stay in Meppel until their deportation in 1942. Only Levy Wolff (went to Dedemsvaart), Emma Hellmann (to Amsterdam) and Salomon Rothschild (was taken into the psychiatric institute “The Jewish Invalid” in Amsterdam) left Meppel earlier. That fleeing from their native country did not help is shown in the following chart with the dates of death of all the foreign Jews who were still in Meppel on the 3rd of October 1942. Steenwijkerstraatweg (the last house on the right). Siegfried Hellmann and Fritz Blasbalg lived.